Preheat oven to 180°C (350°F). Mix to combine the butter, chopped thyme, salt and pepper and set aside. Carefully loosen the chicken skin with your fingers and push the butter mixture under the skin. Place half the bay leaves and half the lemon inside the cavity and secure the legs with kitchen string. Rub the chicken with the extra butter, sprinkle with salt and place in a large lightly greased roasting pan. Add the potatoes, remaining bay leaves, lemon and thyme to the pan. Pour the wine into the pan and roast for 1 hour 15 minutes or until the chicken and potatoes are golden and cooked through. 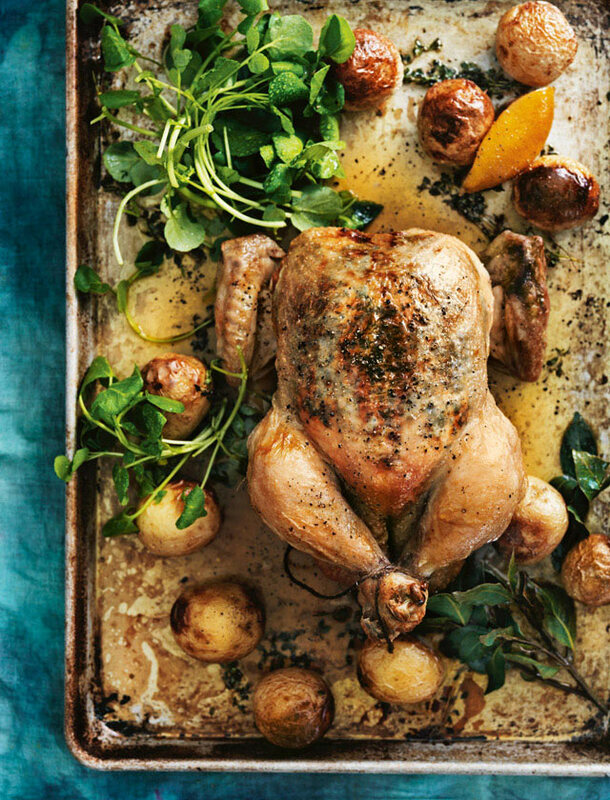 Serve the chicken and the potatoes with the watercress. Serves 4.